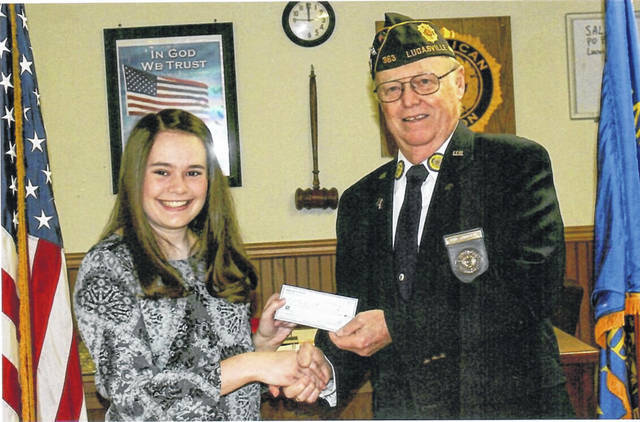 The American Legion and Auxiliary, Post 363 of Lucasville presented its 2018 scholarship awards. Receiving the 2018 scholarship was Valley High School graduate Kaitlyn Burchett. John Ashworth, adjutant of the post, Bliss, treasurer of the auxiliary presented the award. Burchett is the daughter of Susan and Chad Burchett of Lucasville. She is a student at the University of Kentucky, in Lexington, Ky., enrolled in the College of Arts and Sciences, majoring in chemistry. She is also a member of the UK Marching Band. She performed with the band at the Citrus Bowl in Orlando, Fl., on New Years Day during the UK Vs. Penn State football game.